I can compare our rich misers to nothing so fitly as a whale: ’a plays and tumbles, driving the poor fry before him, and at last devour them all at a mouthful. 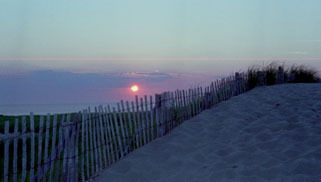 My first trip to the east coast of the USA. 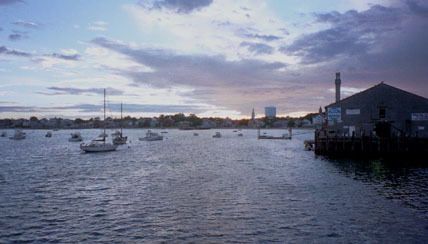 After a heady and humid week in New York City, a few days in Boston and a night visiting Stephen in the New Hampshire forest, I’m now unwinding with a week in Provincetown, the insanely beautiful and friendly little resort flung out into the Atlantic on the very tip of Cape Cod. 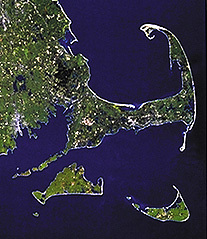 The Cape unfurls from the Massachusetts coast in the most bizarre way. On a small scale map, it resembles an arm, thrust out from the shoulder of the mainland and bent upwards at the elbow, as if showing off its muscles. Look closer, though, at the fist of this arm, and it appears to crook round again and again in an ever diminishing spiral, like one of those endlessly repeating figures in fractal geometry. 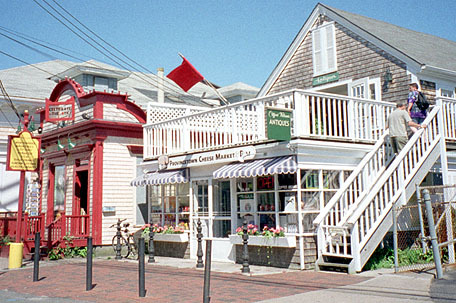 Small wonder, then, that as you follow Route 6 up the Cape you gradually lose all bearings, until you arrive in Provincetown without the faintest idea of which way you’re facing or in which direction to try and spot the mainland. 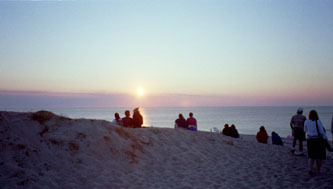 Geography apart, what makes Provincetown unique is its community, or rather the way its disparate communities live, work and get along together. Long regarded as a haven for artists and bohemians of all persuasions, these days it thrives on gay tourism; but it is also home to a sizeable population of Portuguese fishermen and their families, who seem to rub along with their more flamboyant neighbours and the huge influx of summer visitors just fine. The whole world should come here just to learn how to live together. A couple of days into my stay, I decide to take a break from the beaches, cafés, bookshops and tea dances, and take a trip out on the ocean. 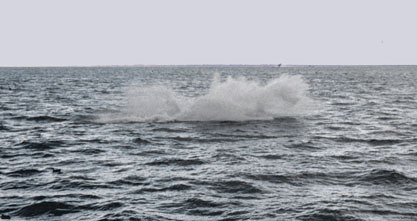 There are large marine feeding grounds off the northern tip of the Cape, notably the Stellwagen Bank, where schools of humpback and minke whales congregate on the annual round trip between their summer home and their breeding waters in the warmer south. Whale watching tours are popular here, but the information leaflet warns there is no guarantee that whales will be sighted on any given trip; I imagine that any we do spot will be some distance from the boat. I take an extra film for the camera, though, just in case. The trip out to Stellwagen takes an hour or more. It’s punctuated by announcements from our guide, preparing us for what we can expect to see; I pass the time in between by fantasising about several of my fellow passengers. It starts to get cold on deck, and I’m just about to go below for a hot drink, figuring there must be at least another ten minutes before we arrive, when someone shouts, "Over there!" Everyone crowds to the port rail. Several hundred yards away, there’s a black mound in the water. 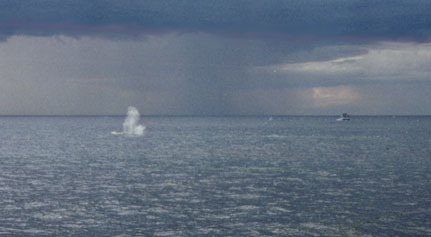 At first I think it’s impossible to tell from this distance what it is; but then I see a white smudge in the air above it, dissipating rapidly in the stiff breeze, and I realise it is indeed a whale, venting spray through its blowhole. The boat turns toward the animal; and then suddenly there’s another, nearer this time. They’re minkes, surface feeding and playing in the choppy water. 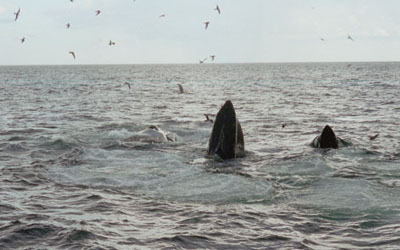 A few more join them to investigate this smelly, noisy newcomer in their midst; and then we spot our first humpback. Of all the species of whale in our oceans, the humpback is somehow the one that seems to inspire the most awe. The size, grace and beauty of these extraordinary mammals is almost overwhelming. We look for rings of bubbles forming on the surface  a sign that a whale is circling below, exhaling a column of air that will trap plankton and concentrate the microscopic organisms into a rich, salty soup. 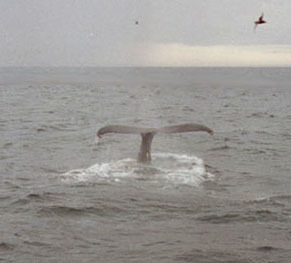 When the whale breaches the surface, it gulps down mouthfuls of this plankton-rich brine, straining it through the curtains of whalebone  the baleen  that hang from its upper jaw, and which distinguish humpbacks and others from toothed whales (such as dolphins), which can eat fish, molluscs and small mammals. 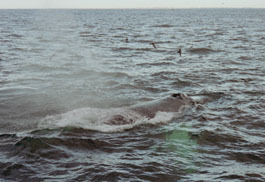 Having fed, the humpback nosedives beneath the surface. The sleek body takes an age to follow, arching out of the water, before the tail fluke  unmistakable from a hundred eco-friendly poster prints  appears. The fluke rises to the horizontal, then plunges back into the water with a slap that sends up a wall of spray, scattering the circling sea birds, only for them instantly to return and pick greedily through the flotsam. There are heavy, slate-coloured clouds on the horizon, and the wind is picking up. A thunderstorm is approaching, but the rain holds off for now. 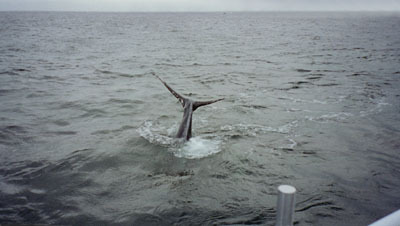 Suddenly, a humpback breaches, its body full out of the water. For a second, we see this animal in all its devastating grace and scale, stretched full length in the air, before it falls back into the ocean with a splash like a depth charge going off. 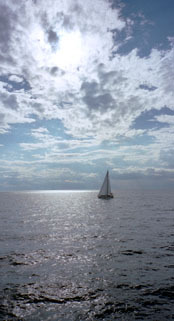 Every observer on the boat is stunned into silence, breath held in the throat. A split second later, two great streaks of lightning pierce the black clouds on the horizon, and everyone jolts back into life, like Frankenstein’s creature reanimated by the electrical storm. Someone gasps, "Wowww! ", and we all laugh. Sometimes, the most complex of emotions are the simplest to express. By now, the humpbacks are everywhere. A mother and calf swim alongside us for a while, before the calf decides it wants to play and dives under our keel. We rush to the opposite rail to watch it surface; the mother follows, gently but firmly guiding her offspring away. I’m in that strange hyperemotional state where you don’t know whether to laugh or cry, so you end up doing both at once. The guide sounds as intoxicated with it all as I am; she’d started off by alerting us to every sighting, calling "There’s one at ten o’clock" or whatever, but now there are so many that she ends up shouting, "Four o’clock  nine o’clock  twelve o’clock  oh my God! ", before dissolving in a fit of delighted giggles. After that, she doesn’t bother pointing them out any more  there’s no need. I’ve noticed that the constant spray is fogging my glasses and camera lens; when I wipe it off, it’s sticky. The guide smiles. "The whale’s blowhole is actually a nostril", she says. "It’s lined with mucous tissue. So the sticky residue you’ve noticed is, well, ..." Several of us get it at the same time. There’s a chorus of "Yeeeugh!" Eventually, after an hour sharing the ocean with these magnificent creatures, it’s time to head home. On the way, I ask the guide about her obvious excitement at seeing so many humpbacks. She tells me that this is her first day back on the job after being away at college studying marine biology; the previous season, she hadn’t seen as many humpbacks in a week as we’ve sighted on this one afternoon. I ask her whether the daily intrusion of tour boats like ours, belching diesel exhaust into the water, has any adverse effect on the animals, and her face falls. "I think it’s bound to", she says. "I just pray that we keep the balance right. By showing the whales to people, we increase awareness of how beautiful and intelligent they are, and hopefully encourage more people to support anti-whaling programmes. But yes, sometimes it makes me uneasy." 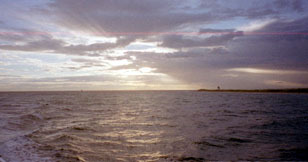 It’s sunset again as we pass the lighthouse at Race Point, and head back into the little harbour at Provincetown. This has been a day to remember. Suddenly, I laugh out loud, realising that what I will most treasure from this holiday will be the memory of clinging to the rail of a boat in a thunderstorm, 12 miles out into the Atlantic, wiping whale snot off my glasses.